I get by with about 4-5 hours of sleep a day. I wish I can sleep longer but I won't allow myself to do that. I spend about half an hour a day walk to and back from work. Then I spend an average of another 30-40 minutes running or workout. I work in an office environment but whenever I get the chance to get away from my desk to walk to the coffeemaker, pick up faxes, or for any other reasons, I do it. So, I spend a lot of my day moving around. What if there is a way to translate those movements into energy for mobile uses? And on weekends, I ride my bike quite a bit to go to the market or gym. That's a lot of energy expended that I am sure can power my iPod or G1 to provide a few extra hours of battery life. I'm swinging my arms when I move. I'm not just talking about having something in the shoes that can translate the kinetic energy into stored electric power. Though that would be cool wouldn't it? We're a t the point where nanotechnology can be used to create clothes that can potentially allow movements and the energy created to be stored in some manner. Here is a device similar to what I'm talking about. 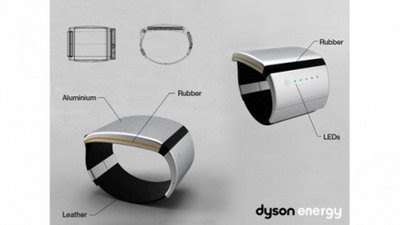 The Dyson Energy Bracelet that takes into account the temperature differentials to produce electricity. If just a few degrees in temperature can produce electricity, imagine what a day's collective movements of 4-5 hours can produce. As you probably know, there are jackets with flexible solar panels on same for years now. I can say from the looks, wearing a solar panel on your back will get you attention but not the type one would hope if you know what I mean. But if a jacket, pants, or shirt can be lined to translate the kinetic movements of your body and heat into electricity, it can be quite a useful tool. For a mobile warrior like myself who works in an office. Law enforcement. The Fedex and UPS drivers. There are dozens of professions where constant movements is a part of the job. I imagine there could be a few of these folks who probably would like the extra power their muscles can provide their mobile devices. If you know of such devices or research, please let us know and we can keep an eye its developments. Increasingly, more and more tasks will depend on mobile Internet. And since longer battery life for smartphones and mobile devices comes not from advancements in battery technologies but rely on more and more efficient electronics, "kinetic wears" such as the ones I'm talking about here can provide the wearer greater efficiency, or at the very least, not having to worry about their devices running out of battery. The Dyson device (to be available in 2012) makers state a few hours of wearing it will change a mobile device and provide a few extra minutes of talk time for a cell phone that can be charged through a micro-USB. Suppose if they made it so that it can attach to the wearer's belt and be powered through his or her body, perhaps more power can be created than through temperature differences.